Water disinfection is a critical part of any emergency plan. One of the most often recommended techniques is to disinfect water using regular chlorine bleach. The problem with household beach as a disinfectant is that it has a shelf life of only 6 months from the time of production. The chlorine gradually gets weaker and weaker in storage, which means that older bleach will not have the power to kill bacteria and viruses lurking in your water. How can I use chlorine to disinfect water if the disaster lasts longer than just a few months? The answer is powdered or granulated calcium hypochlorite which has up to a 10-year shelf-life. In this post, we will share with you exactly how we use calcium hypochlorite for water disinfection, best practices for storing calcium hypochlorite and the limitations of chlorine as a disinfectant. A one pound bag of calcium hypochlorite can treat over 10,000 gallons of water. That little one pound bag is mighty powerful and requires a little bit of special handling to get it ready to disinfect water. If you are disinfecting a 55-gallon barrel of water you simply add 1/8 teaspoon of dry powder to the water. You will need to make a 5% chlorine stock solution to disinfect any smaller amount of water. 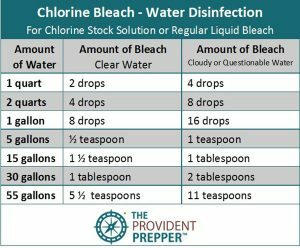 Follow the directions on this chart to ensure that you get the right concentration of chlorine in your stock solution. The Departments of the Army, Navy, and Air Force released a publication entitled, Sanitary Control and Surveillance of Field Water Supplies, on 1 May 2010 where they set standards for use of calcium hypochlorite for water disinfection in the military (U.S. Army Center for Health Promotion and Preventive Medicine 2003). The calculations to create a stock solution from dry calcium hypochlorite on the table are taken from those military standards. They recommend, “If your measuring device is not as precise as the number you come up with, it is generally advisable to round the calculated number up to ensure you get at least the dose you intended to provide.” To simplify measurements the calculations on the table have been rounded up with the exact amount in parenthesis to the right. The standard calculation for a 5 percent stock solution is based on dissolving one teaspoon of 68-70 percent dry calcium hypochlorite in 1 ½ cups of water. This 5% chlorine solution can be used to disinfect water just like liquid household chlorine bleach. Storing it in powdered form enables you to make small batches of fresh liquid bleach as needed to ensure you have the right amount of available chlorine to do the job. Experiment with creating your own stock solution. You can store the 5% stock solution in a small labeled glass jar. I have an old bleach bottle that I have marked with measurements for my stock solution. I simply fill the bottle to the mark and add the amount of calcium hypochlorite specified on the bottle. It makes it incredibly easy and it is obvious to everyone exactly what the bottle contains. It would be a good idea to label the container with the date you mixed up the fresh batch. 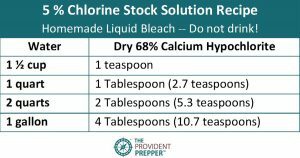 Once you have mixed up the 5% chlorine stock solution, you can use it with the standard directions for disinfecting water using regular chlorine bleach. Add the recommended amount and allow at least 30 minutes of contact time before consuming. Calcium hypochlorite is a dangerous chemical and requires special handling. 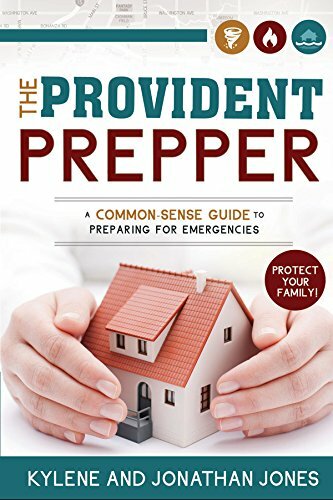 As a prepper, sometimes our best intentions help us to learn expensive lessons as demonstrated below. We have some friends who created 3 identical Rubbermaid totes, each containing a stainless steel gravity water filter, an unopened glass bottle of Polar Pure, and calcium hypochlorite packaged inside of a re-purposed plastic bottle tucked inside of a Ziploc bag. The AquaRain filter was brand new and still in the original plastic inside of the original cardboard box. Each of these totes were intended to be emergency water kits ready to go at a moment’s notice. Two years after carefully packaging up their emergency water kits, they went to check their preps only to discover that the stainless steel had split and the metal was rusted and corroded. All three of the emergency water totes had identical results, completely destroying the stainless steel water filter in each box. The photos below show the contents inside the tote along with the damage to the filter. We do not know exactly what caused the damage, but the calcium hypochlorite is definitely suspect. It is amazing that it only took 2 years for these stainless steel filters to be destroyed. Chlorine is a known corrosive to metals so be very careful how you store it and what you store it near. The Safety Data Sheet on calcium hypochlorite states that it is stable but reacts with reducing agents, combustible materials, organic materials, acids, and moisture. It is extremely corrosive in the presence of aluminum, corrosive in presence of steel and slightly corrosive in the presence of glass and stainless steel. It is very hazardous if it comes in contact with skin or eyes or if it is ingested or inhaled. It is best to wear gloves, goggles and a mask when handling. According to a chemical engineer friend of ours, dry calcium hypochlorite does not react with polyethylene, polypropylene, polystyrene, Ryton, PVDF and Teflon. If you must change containers, make sure that both the container and lid are made materials it does not react with. I was under the impression that it is best to store calcium hypochlorite inside of its original container, placed inside of a glass bottle and sealed with a plastic lid. The bottle should be stored in a cool dry place away from almost everything. This well-laid plan was not without issues. The original bag is some type of heavy plastic and over time (5 years in our case) the bag shredded inside of the jar. The original bag became quite fragile and fell apart when touched. The pieces mixed with the chlorine powder and was a bit of a mess. I took this newly acquired knowledge and altered the way that I store our calcium hypochlorite. Now I carefully pour the powdered chlorine into a clean, glass jar and seal it with a plastic lid. Then I attach our instruction label to the bottle with packing tape to ensure that I remember exactly how to use it in an emergency. The shape of the jar makes it a bit challenging, but at least all the information is there whenever I may need it. You can get a free PDF copy of the instruction label shown below by clicking here. We also store small amounts of calcium hypochlorite in airtight prescription bottles with a child-resistant cap. The plastic is permeable so be careful not to store it inside of a tightly closed container. I have one of these little bottles in our first aid kit and in our survival kits. It is nice to know that I can make a little stock chlorine solution for disinfecting water, dishes, laundry or surfaces if we need to evacuate. Be careful not to allow the bottle to be stored near anything metal. What Are The Limitations of Chlorine in Water Disinfection? Chlorine can effectively disinfect water. It is important to note that it may not deactivate some protozoa such as giardia and cryptosporidium. 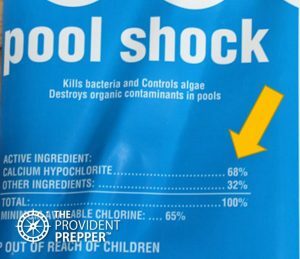 The American Red Cross recommends using liquid chlorine bleach with a sodium hypochlorite concentration of 5.25% to 6% as the only active ingredient. Use only plain liquid bleach with no thickeners, scents or additives. The problem with household bleach is that it has a shelf life of only 6 months. As time passes the chlorine level decreases and it is less effective. Frequent rotation is critical for bleach to be effective at killing pathogens. Powdered or granulated calcium hypochlorite is an effective option for chlorine disinfection. It has a usable shelf life of up to 10 years. Calcium hypochlorite is sold as “pool shock.” It is commonly found in a powder or granulated form containing 68% calcium hypochlorite and other salts. Be sure to rotate your stock to ensure you have the freshest supply possible. Once you mix up a stock solution of calcium hypochlorite it weakens at a similar rate to household bleach. It is best to mix up fresh batches. I have noticed that the older calcium hypochlorite does not seem to dissolve as quickly as the newer stock. It is always smart to be sure that you keep your supply rotated. It is much less expensive to buy it by the case. You really don’t need more than 1 or 2 bags so consider purchasing a case and sharing it with friends and family. The ability to disinfect drinking water and surfaces may be critical to your survival. Check out our post Making Water Safe to Drink: 7 Disinfection Techniques to learn more about alternative ways to disinfect water. Chlorine disinfection is an effective way to kill viruses and bacteria.